Luxurious Soaking Tub. Enough Said. Epsom salt (magnesium sulfate) baths are among the key therapeutic services at our Day Spa at Groton Wellness Center. Your cares and pain are eased away as you slip into a large soaking hot bath infused with these powerful natural salts, mimicking the hot springs baths known worldwide for their deeply therapeutic value. Muscles are highly responsive to magnesium as they contract/relax based on mineral salts. Soaking in a hot tub of water is always comforting. Water is a healing modality in itself in some countries. The combination of the salts and hot water induce a relaxation response and improve the circulation in sore, tired muscles. Additionally, hot water induces sweat, enabling the skin, the body’s largest organ, to release toxins. It is completely safe and very effective! We use only specialized therapeutic clay for our detoxifying baths, chosen for its safe and effective all-natural properties. One bath can release years of toxic environmental pollutants accumulated in your body. Clay’s negative electrical charge pulls the positively charged heavy metals and toxins, attracting them like a magnet. 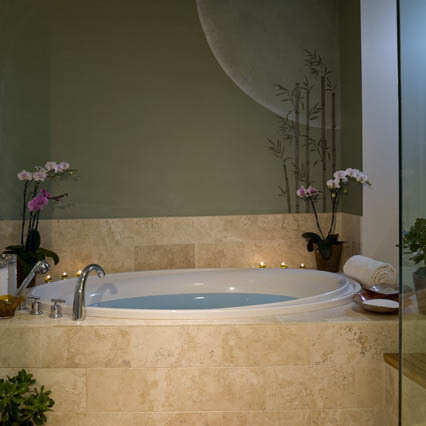 You can extend your body the length of our luxurious soaking bath for ultimate relaxation. People have used therapeutic clay baths for thousands of years the world over. After 4-12 baths most people feel a sense of relief and wellbeing. Detoxification is, however, a gradual process and you might very well benefit from a longer series of baths. Many factors come into play such as age, general health and the total burden of toxins lying within the body. You can expect a one-hour spa treatment including a light skin brushing, preparation for the bath, ample spa towels, robe, natural aromatherapy and music if you wish, followed by a shower. You may follow your bath with an additional body-calming/cleansing treatment, or have a nutritional snack at the Café, making it a most relaxing and enjoyable experience.